I just finished watching the Honorable Minister Louis Farrakhan's interview with ZIZ Television in Saint Kitts. The program was broadcasted live over the internet by The Final Call tech team. As we have done during every live speech and interview he has done in 2011, many of us tweeted as much of his words as possible. He said so much, but his words to/about the youth of the Caribbeans stood out the most. "Young people: You're the best generation we have ever produced. All you need is right guidance," he said. "How can our young people move forward if our elders are still mentally enslaved to our former slavemaster?" The replay of this interview will be posted on FinalCall.com soon. The day before, on Dec. 19, Minister Farrakhan appeared on St. Kitts' Freedom FM radio station. [Click here to watch the replay] The one statement he made in that interview that had Twitter buzzing earlier was the fact that he said "Unfortunately, he (President Obama) has become an extension of George W. Bush." 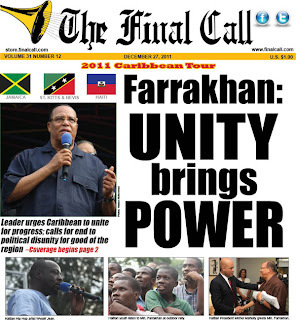 In the latest edition of The Final Call Newspaper, we have extensive coverage of Minister Farrakhan's Caribbean tour along with some dynamic exclusive photos such as the one taken in Haiti by Bro. Hassan Muhammad. Read the front page story and more by clicking the cover below. Support the Black-owned Media!